Dubbed ‘the navel of the world’, Easter Island in the South Pacific is as much a place of startling marine biodiversity as it is of eyebrow-raising mythology. However, little marine research has been done before now, and establishing a baseline of data to inform future conservation management in this part of the world is no mean feat. Lauren De Vos speaks to SOSF project leader Naiti Morales Serrano about the challenges and triumphs of starting science in far-flung places. The rock art and petroglyphs of Rapa Nui are etched onto its basalt boulders, or carved onto the smooth, ancient lava flows called papa. Marine life around the island is linked to many legends, and tuna, swordfish, whales and crabs feature prominently in rock art, particularly on the island’s north coast. Sharks sketched onto the rocks, swimming eternally against the passage of time, are another reminder why Naiti Morales’s work is important. Whitewash broils in an angry sea, building momentum before dashing itself against the island. Few have set foot here before; the only hint of human presence is a lighthouse that blinks forlornly at the night sky. The allure of an ecosystem both unexplored and unexploited is like the promise of a new land that guided the first Polynesian navigators to this region: magnetic. Waves pulverise volcanic rocks, jagged teeth bared to the sky. A boat-load of researchers judge their approach. Spying a gap in the incessant pounding, the skipper gives the throttle rein and the boat shoots forward. The scientists and camera crew prepare to leap ashore. Water starts to heave back up the sides of the island, sucking the boat perilously close to the rocks. Timing is critical. The skipper must get close to the island to allow disembarkation without beaching their craft. As they backpedal, the motors growl in opposition to the pull of the water. In a nimble nanosecond, scientist Enric Sala leaps safely onto the island of Salas y Gómez. Few people would find in this scene from the documentary The Lost Sharks of Easter Island the inspiration to start their PhD. Doing so would require that they cast aside serious misgivings about the isolation and challenges. But in Naiti Morales Serrano it sparked an idea. In the film, scientists Enric Sala, Carlos Gaymer and Alan Friedlander explore Easter Island and neighbouring Isla Salas y Gómez. Their mission? To highlight the region’s biodiversity and muster support to address its challenges. ‘I saw that and I thought “Okay, I want to work there!”’ recalls Naiti. After graduating with a degree in marine biology, she had already worked at various jobs to nurture her passion for sharks. ‘I worked with kids too, teaching them about sharks, and that was really cool!’ She sought out Carlos, convincing him to take her on as a student. ‘I said, I know you don’t work with sharks, but I really want to do this, and I saw this documentary…’ she pauses, ‘and I have some ideas, so … can I work with you?’ Now a PhD candidate based at the Universidad Católica del Norte in Chile, she is one of those rare people who find meaning in taking up a challenge. 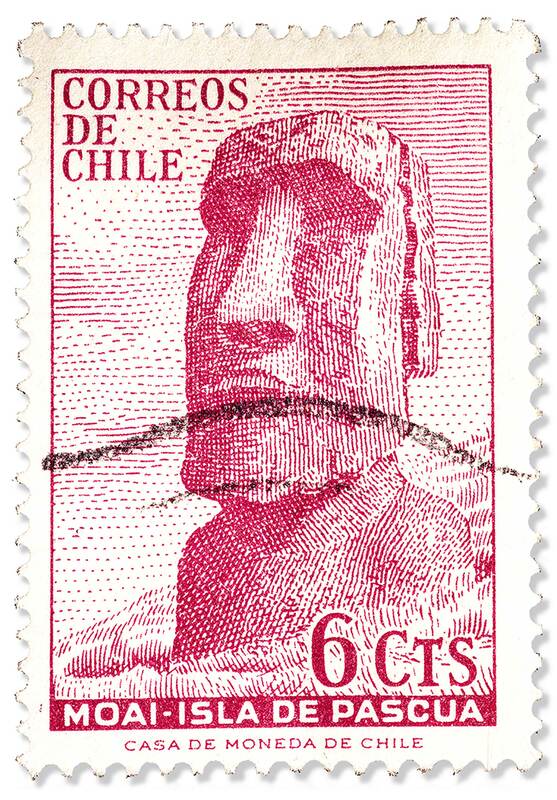 Easter Island, or Rapa Nui by its local name, is the most remote inhabited island in the world. Flung 3,700 kilometres west of the Chilean mainland into the Pacific Ocean, it is the easternmost of the Polynesian islands and forms part of what scientists call the Easter Island Ecoregion. Salas y Gómez, known locally as Motu Motiro Hiva, is its uninhabited island neighbour 400 kilometres to the east. Two rocks standing sentinel in a vast sea, Motu Motiro Hiva has a combined area of a mere 0.15 square kilometres. The whole Easter Island region has a volatile history, both geologically and anthropologically. Volcanic activity, thanks to the Easter Hotspot that boils deep below, gave birth to the islands and sea mounts that characterise this area. The sea mounts are essentially underwater mountains that range in age from 8.4 million to 13.1 million years, forming the Easter Sea Mount Chain and stretching eastwards from Rapa Nui for nearly 2,000 kilometres. Both Rapa Nui and Motu Motiro Hiva are considered geological youngsters, their youthful 0.8 million years recent history compared to volcanic elders like the Hawaiian islands. ‘I’m trying to figure out how things work for top predators around Easter Island,’ Naiti begins. The island is a territory of Chile, and a projection by that nation’s Instituto Nacional de Estadísticas put the population of Rapa Nui at an estimated 6,600 people in 2016. Although there is a tradition of harvesting from local waters, there is currently no formal spatial protection for marine life around the island. 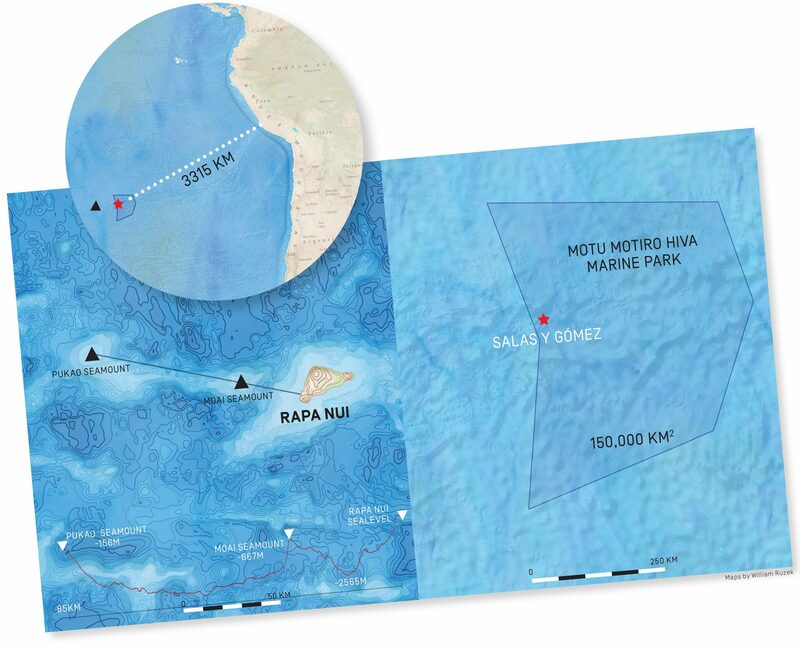 However, in 2010 the Chilean government declared the waters around neighbouring Motu Motiro Hiva a marine protected area, with an extent of 150,000 square kilometres. ‘My thesis looks at how top predators relate to these two areas,’ explains Naiti. She wants to find out which predators are found around Rapa Nui, and to do so she deploys Baited Remote Underwater Video Systems (BRUVs) to assess their abundance and diversity. She is also exploring how these populations are connected between the two islands. ‘For that, I’m doing genetics and tracking with satellite tags. I’m going to be using stable isotopes as well,’ she elaborates. In effect, her project is a bid to tease out complex relationships in an ecosystem where top predators are both important and of conservation concern. Moai statues keep solemn watch at sunset over the South Pacific. They have baffled scholars through the ages, with the jury still out over what they represent and when and how they were carved. 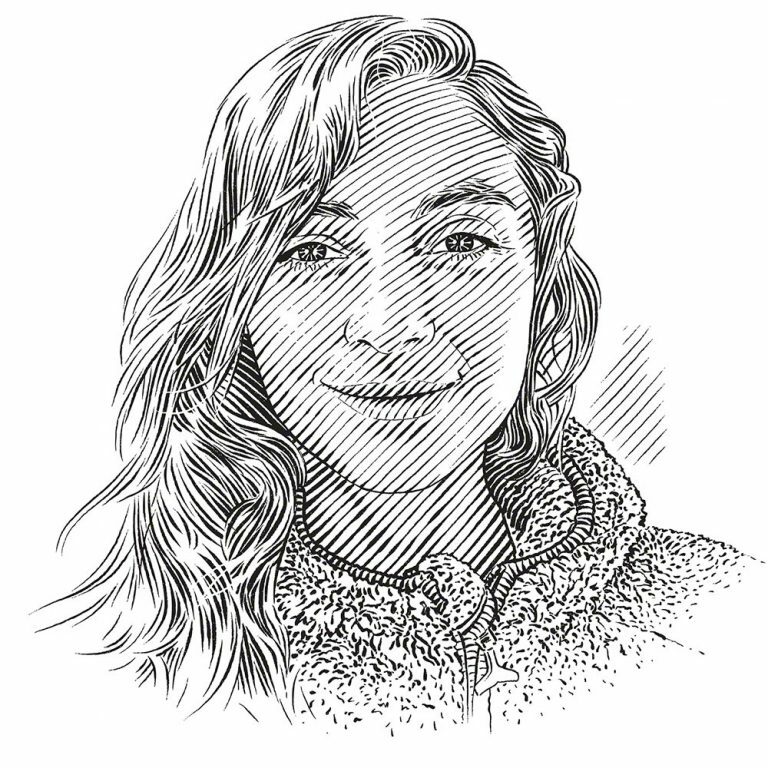 However, it’s the world beneath Rapa Nui’s waves that keeps marine scientists like Naiti Morales coming back to ask questions. Starting a project in one of the most isolated regions of the world takes an uncommon kind of grit. I ask Naiti to describe what learning to work here has been like. Her response is measured: ‘Unique, expensive, unknown, uncertain.’ The weather, a growing list of field-work expenses and her reliance on local fishermen for access to their boats are persistent challenges. She first visited Motu Motiro Hiva in 2015 to tag sharks and fishes like Seriola lalandi, as well as to take genetic tissue samples. The Save Our Seas Foundation has been helping to sponsor her work with BRUVs and in September and December 2016 she deployed her first cameras around Rapa Nui. The BRUVs film different species that swim into the camera’s field of view, giving scientists a record of the composition of the community and the relative abundance of each species. The cameras are deployed from a boat and fish are attracted by the scent from a bait canister attached to the system. Naiti’s BRUVs are pelagic, which means that instead of being deployed on the sea floor, the cameras hover at about 10 metres from the surface. This is a non-extractive way of recording the highly mobile, often diver-shy predators that rule the open ocean. Adversity makes Naiti organised. ‘Equipment and tools are expensive and really basic. These limitations mean I have to try to buy everything I might need in advance. Sometimes they’re things I’ve never used before.’ So what keeps her committed to this capricious place? ‘Magic,’ she replies. On a computer screen, a map of this region glows red, yellow and blue. This is how a satellite sees swathes of tiny marine plants called phytoplankton from space. Their populations blink back from the screen in colour codes that scientists use to model their abundance. High concentrations gleam in warm colours; low abundances in blue hues. Plankton, the building blocks that underpin the marine food chain, glow nutrient-rich red near the Chilean coast and yellow near the equator. By contrast, the expanse of water around Rapa Nui glimmers blue. Its waters are clear, but much of the Pacific Ocean here is nutrient poor. In the South Pacific Subtropical Gyre, the great swirling ocean circulation that dominates this region, phytoplankton are found deeper, at about 150 metres. Prominent as ‘biological oases’ in this nutrient-poor water are Rapa Nui and Motu Motiro Hiva, located at the heart of the gyre. Here, tell-tale red glows around the two islands on satellite images. The result of this plankton profusion in the immediate vicinity of the islands is an ecosystem that is home to 142 endemic species – a collection of life found nowhere else on earth. Were the biological interest of these islands not incentive enough, their conservation imperative surely is. Twenty seven of the species found here are listed on the IUCN Red List of Threatened Species. According to the Pew Charitable Trusts, 10 of these species are of special conservation concern, among them the Endangered loggerhead turtle and blue whale and the Critically Endangered southern bluefin tuna. The trusts’ commissioned analysis found that the area is a spawning ground for predators such as marlin, swordfish, tuna and an assortment of shark species. Hydrothermal vents, the only features of their kind in Chilean territorial waters, hint at an ancient past that gave rise to the startling array of life found here. Naiti works with the Millennium Nucleus for Ecology and Sustainable Management of Oceanic Islands (ESMOI). ‘In this group, there are people working on different topics. It’s a big group because we are trying to study everything!’ she says. That’s an ambitious undertaking, and with good reason. Rapa Nui is an oft-cited study on how we harm the environment at our peril. In about AD 1200, ancient Polynesians settled on Rapa Nui and thrived, their ingenuity evident in the giant moai statues and ahu ceremonial platforms that form part of this UNESCO World Heritage Site. Scholars disagree about exactly what happened next. Jared Diamond writes in Collapse that Rapa Nui is the ‘clearest example of a society that destroyed itself by overexploiting its own resources’. He blames farming for the deforestation, calling the islanders’ fate ‘ecocide’. New theories blame the introduced Polynesian rat, which amplified rates of deforestation and the loss of native species. Whatever the reason, once European colonists arrived in 1722, introduced diseases coupled with Peruvian slave-raids felled the weakened population to 111 individuals in 1877. Today, Rapa Nui’s inhabitants are a mix of descendants from the ancient population and diverse immigrants. 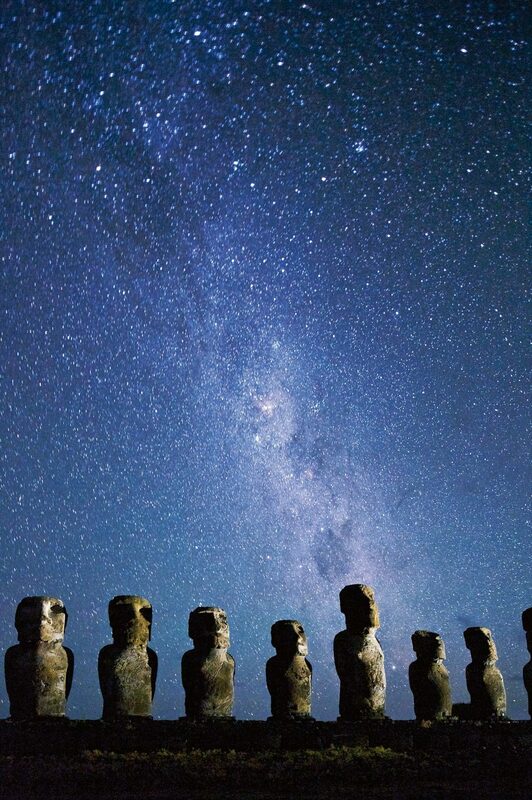 The ancient Polynesian mariners who first colonised Rapa Nui were celestial navigators, forging a route across the Pacific guided by the stars that light the night skies. Today, international flights and modern seafaring make Rapa Nui infinitely more reachable, but the region remains a challenging place for scientists to work in. ‘When you live on an island, you’re directly connected to the sea,’ says Uri Erisa Tuki, a local craftswoman, in the documentary Voices from the Sea. The problem is that the impacts from local fishing are now amplified by threats from the outside world. New colonists from a modern world gone consumer-crazy wash ashore as plastic pollution, while illegal, industrial-scale fishing vessels have quickly sniffed out the most vulnerable underbelly of Rapa Nui: its isolation. Windswept, rugged and largely devoid of the wooded trees that historians argue ancient inhabitants depleted, Rapa Nui is dwarfed by the South Pacific Ocean from which it emerged 0.8 million years ago. A caldera, the tell-tale scar left by a collapsed volcano, speaks to the island’s volcanic origins. I ask Naiti about this ‘baseline’, knowing as she does that Rapa Nui is a highly impacted system. She nods in agreement and I offer the term ‘shifted baseline’. We discuss this interesting conundrum: a place that for the most part is scientifically undescribed, but where the impacts of human activity echo across the ecosystem at all levels. The effects are usually felt most keenly in the declines of top predators: those large, aggressive fish that we tend to deplete first. Naiti has shown scientifically that there are still sharks to be found around the island, but it seems they are no longer as abundant as the old Rapa Nuian artefacts suggest. She describes an ancient form of fishing still used today. Fishing line and bait are wrapped alternately around a piece of volcanic rock, which is then thrown to the sea floor at a depth of about 100 metres. The rock rolls along the sea floor and unravels the line, while the fishermen wait at the surface for a bite to the hook. This method is juxtaposed with the nets used to catch small fishes near the coast and the rampant illegal fishing from foreign vessels. What is the reference point for recovery in a system that blurs the lines between ancient culture and encroaching modernity? The concept of a shifting baseline is famously outlined by fisheries scientist Daniel Pauly. In his talk ‘Our Ocean’s Shifting Baseline’, he tells the story of Charles Darwin in the Galápagos, who wrote in 1835 that the sailfin grouper Myctoperca olfax was very common. Indeed, Daniel continues, the species was a mainstay of a large fishery well into the 1980s. The sailfin grouper is now classified as Vulnerable on the IUCN Red List. ‘The point is, we come to Galápagos, we still think it is pristine. The brochures still say it is untouched. So, what happens here?’ he asks. Daniel argues for marine protected areas, where we can recreate the past in a way that people can see what it was like. Without this visual evidence of change, this comparison between exploited and unexploited ecosystems, the scale of declines is hard to conceptualise. ‘Nothing has changed, and yet everything has changed,’ he says. Life on the most remote island in the world is closely linked to the ocean. The seas around Rapa Nui and neighbouring Moto Motiro Hiva can be wild, but they have been a source of income and sustenance for fishermen for centuries. The challenge now lies in how to manage this biodiversity in a rapidly changing social and ecological climate. If the baseline at Rapa Nui has shifted, then perhaps it’s to Motu Motiro Hiva that scientists will look as a reference point. Archaeologist Edmundo Edwards’s tone is reverential in a clip from Lost Sharks of Easter Island: ‘What you’re going to find in Salas y Gómez is much more spectacular. You’re going to see how Easter Island was before the first settlers arrived here. You’ll find the whole ecosystem there, intact. You’ll see how the world was 2,000 years ago.’ Named for two Spanish explorers who were the first Europeans to describe the island in 1805, its local name means ‘islet on the way to Hiva’. Hiva, meaning ‘far-off lands’, is the name for the homeland in Polynesian myths. With no freshwater sources and a precipitous coastline that makes landing on the island tricky, Motu Motiro Hiva gives us that tangible reference point of which Daniel speaks. Deploying BRUVs around Motu Motiro Hiva will take the already complex logistics of Naiti’s project to new heights. Depending on funding and time, she hopes to survey this second island in April 2017. In the meantime, she looks forward to deploying more BRUVs around Rapa Nui to record new elasmobranch species for the region. Her excitement is infectious. ‘According to the fishermen, there are at least three other species: thresher shark, eagle ray and sometimes tiger shark. None of these species has been scientifically recorded … yet!’ I ask Naiti whether the idea is for BRUVs to continue after her project wraps, as part of a monitoring programme. ‘That’s the idea, yes,’ she replies. The work of the ESMOI scientists has already been compiled into a glossy publication packed with information and photographs to capture the public’s interest. Mata ke te Moana does for a wider audience what Naiti did for me: bring the magical underwater realm of Rapa Nui ashore, raising its profile to match the mythology of the ancient moai that stand silent sentinel on land. The swirling ocean gyres and midnight skies in this part of the world have drawn pioneers, dreamers and explorers to its heart over millenia. The first Polynesian settlers are thought to have sailed by the stars from the Tuamotos, or the islands of Mangareva–Pitcairn–Henderson. For a group of modern scientists, the ocean hinted at as much as the starry skies had promised those first Polynesian sailors: a new world. 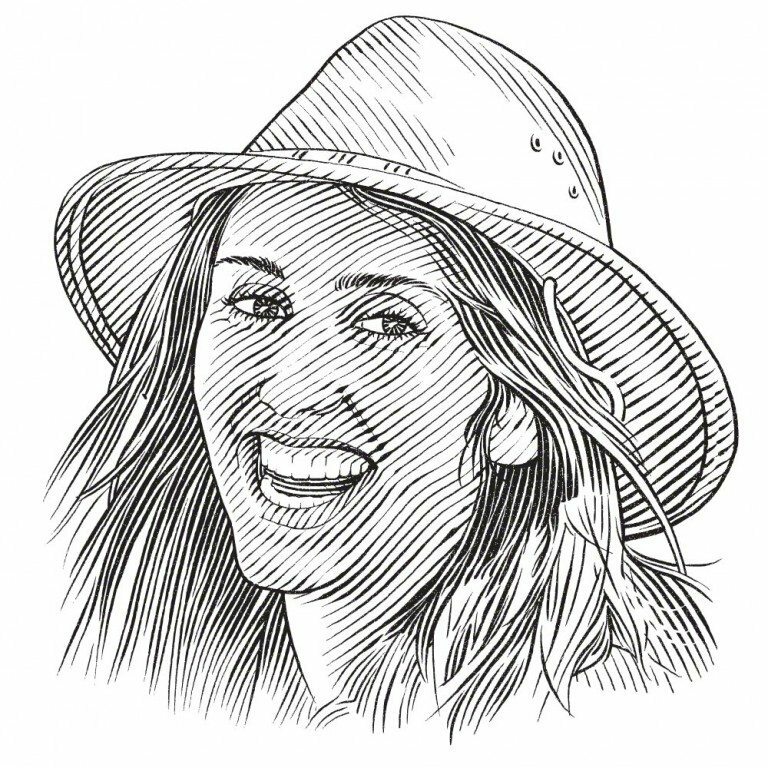 Naiti, equipped with her passion for sharks, the lens of modern science and the new eyes of evolving technology, is perhaps just the latest in this ancient procession of pioneers. As her cameras bring in evidence that sharks are still sovereign in these waters, we can all look to learn once again from Rapa Nui about how we live on this planet. With the new information that Naiti’s research will illuminate in the coming years, there is the chance that this time it might not be too late.